With Google running up to 200 trials on its search engine results at any one time it is easy to miss many of their changes, however the evolution of Local results promises to have a very real impact for businesses who rely on being found by their location. Knowing how to improve your position in Google’s Local listings is an essential skill to learn. Local results catch the eye, appearing in their own box with thumbnail images, titles and striking design, and that undoubtedly means more clicks for the companies that feature. When the user clicks on a business name in local results, an expanded view of that business is revealed along with a long list of alternative companies. 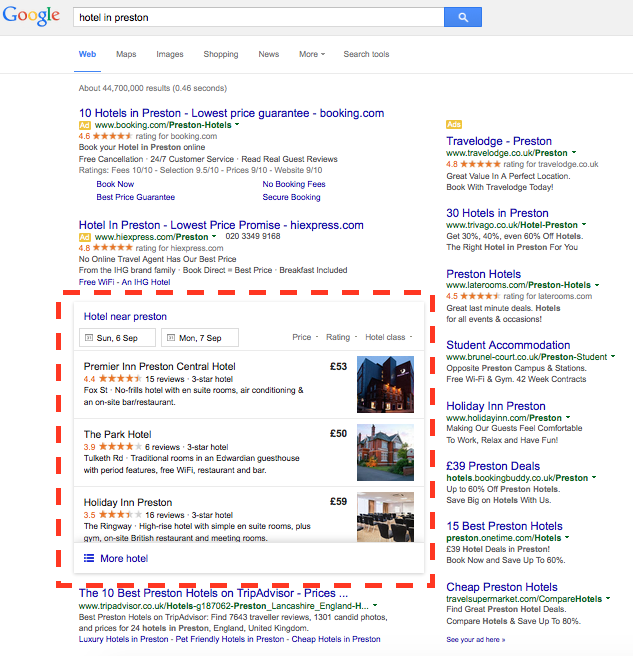 Why has Google created local listings? Google is constantly trying to find new ways of improving the search results it delivers by negating the influence of people who are trying to fool its algorithms, in favour of delivering results that best meet the needs of the searcher. Local search is simply an extension of this. 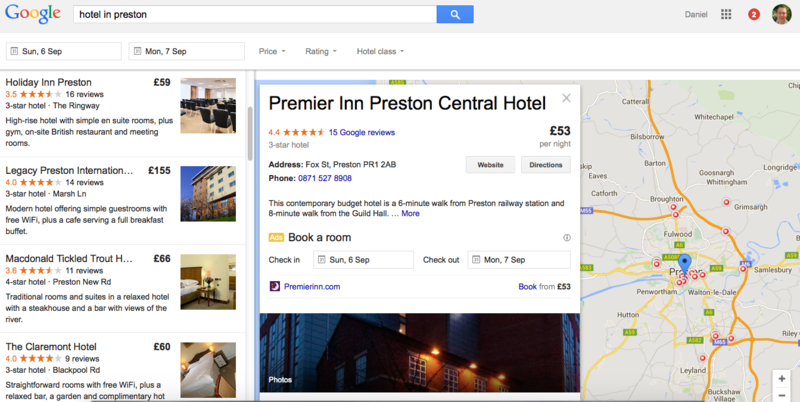 Search for a “hotel in Preston”, and it makes sense that Google returns a list of hotels in Preston. 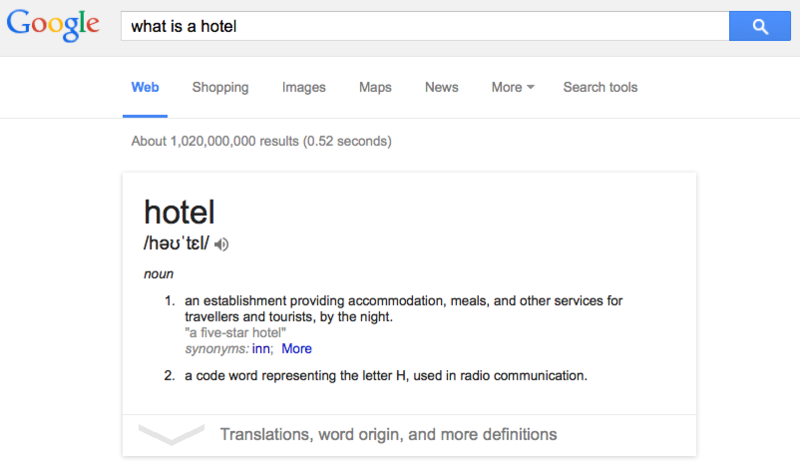 And Google pulls information from a variety of independent sources to level the playing field for hotels that don’t have an SEO expert helping them out. So Local search is Google’s attempt to deliver results that are free of website design and SEO influence. Why is Local search important for companies? Are Local results popular with users? Although there are no studies specifically showing the impact of Local listings, there are a couple of very strong reasons to think that they drive large amounts of traffic. The first is that research have proven that the higher an organic listing, the more clicks a website receives, and organic listings generate more clicks than adverts. With Local results given prominence above organic listings, it seems safe to assume they will attract a high proportion of clicks. And the second signpost to their success is that Google believes in them, and has continued to work on improving their display and promoting their visibility. Google has a track record of dropping features that visitors don’t use. Understanding where Google draws local search data from helps to explain how Local listings work. Google encourages all business owners to to register their business with Google My Business (formerly Google Places). Their records their address details online and creates a Google Plus page. However, Google only views this as one source of data and looks for independent verification of your business details. According to the experts at Moz.com (https://moz.com/learn/local/local-search-data-uk), the search engine gets this (for UK businesses) from official sources including Companies House and the Royal Mail, and from data aggregators such as BT, Thomson Local and Central Index. Google also looks at the consistency and quantity of links a business has from listing websites, known as citations sources. According to Local Visibility System, there are more than 60 of these for the UK market: http://www.localvisibilitysystem.com/definitive-local-search-citations/#uk. The final piece of the jigsaw is the business’s own website, which Google searches for proof of location, looking for references to your local area. How can I improve my Local search listing? Keeping your business profile up to date across a wide range of sources is key to improving your Local listing. Consistency is crucial to maximizing your impact with Google – every time you change ‘Sandy Holiday Park’ to ‘Sandy Park’ or ‘Sandy Caravan Park’, you potentially confuse the search engine and water down your ranking. Start by ensuring the address details on your website are correct and consistent with how they appear for third-party sources. Ensure your site has plenty of references to your local area, especially on the homepage. Include your town/city in the title tag, in headings and in your body text. Register on Google My Business to manually enter your business details into Google. Ensure your details appear in the same way they would on other sites. This will create a Google+ page, where you can add brilliant pictures of your business that Google can then pull through to your Local listings. If you already have a Google+ page, your Google My Business section has already been created – check the details are still correct. Have you moved? Check that your address details with Companies House, the Post Office and utilities providers are correct and consistent with how they appear in other places. Ensure your address is listed in a consistent and correct manner on citation websites – work your way through this list: http://www.localvisibilitysystem.com/definitive-local-search-citations/#uk. A few weeks after changing your citation listings, try searching for your business on Google and check the results. If you find any errors, track them back to the source and ask for them to be changed. Can you get links from other local sources? Find local review sites, a profile opportunity with the local newspaper, the local chamber of commerce or tourist board, and local suppliers who can link to you. If you’ve followed all of these steps and your website is still not ranking at the top of your Local listings, don’t lose heart. You have done everything right, so you’re in a good place for future improvements. Sit tight and you may find that your ranking improves over time, or an unannounced algorithm change may give you a bump. Do you really deserve to be top of those rankings? Remember, Google’s number one mission is to return the most accurate results, so if someone searches for “Hotel in Little Bottomley”, don’t expect to outrank businesses in that location if you’re located in nearby Upper Bottomley. Be amazing. When there are lots of relevant businesses competing for the top spots in a Local result, the usual rules of good SEO still apply. Everything from original content to quick load times to low bounce rates will help tell Google yours is a website that deserves a high ranking. If you need help with search engine optimisation, why not contact me to chat through your requirements.